The MUP Tour is a tour offered every year by the League of Michigan Bicyclists. It is a loop around some of the small towns in the UP that includes some of the most breathtaking photo ops, like waterfalls, light houses, shorelines, operating shipping locks, and museums. I thought I would start by sharing some of the most memorable moments of the ride, good and bad, and then give a short description of the route each day. I have to mention the weather because a blog about a tour would not be complete without it; and I wouldn’t be the Reluctant Cyclist if I didn’t grumble at least a little bit about Mother Nature’s quirky ways. It was July, people. There was a day as high as 86⁰F and we had a couple of nights dip to 50⁰F. We had 20 mph headwinds with rain and cold and we had a bright sunny day with a nice tailwind. Think Lake Superior; ship wrecks; Edmund Fitzgerald; unpredictable weather and you will be able to describe the tour of the UP. Be sure to check out the routes on my "Most Recent Tour" page. Jim's (aka Bike Junkie) most memorable part of the week was talking with about eight other cyclists over some great beer at the Soo Brewing Company. You will come to find that craft beer tends to make it to our favorite list every time. Ethan’s (son of the Reluctant Cyclist) most memorable moment was hanging with his mom (me) and Jim at the Soo Brewing Company (more beer) after the halfway buffet at Lake Superior State University. He also loved the opportunity to ride his bike downhill at about 40 mph on Sugar Island, just across the bay from Sault Ste. Marie. 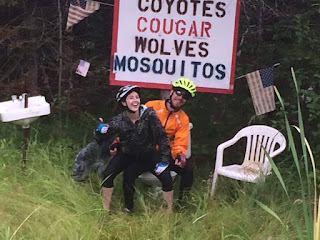 Chelsea’s (girlfriend of Ethan) most memorable moment of the week was pushing through 62 miles of rain, head winds, and hills as a beginner cyclist. Yay Chelsea. You did us proud! My most memorable part of the tour was when we rearranged the tent before going to sleep. At about 2:00 a.m. Bike Junkie had to use the bathroom. Being the engineering type he was all confused because we moved his stuff, which meant he couldn't find his shorts or t-shirt. (You know where this is going, right?) I pretended to be asleep but laughed to myself when I caught a glimpse of his scantily clad buttocks sneaking out of the tent in the cold night air to run to the porta-potty in Paradise. I need to put a plug in here about how proud I was of Ethan and Chelsea for riding every day without once complaining. And there were some very notable things to complain about. We will get to those in a bit. Buying way too much Murdick’s fudge on Mackinac Island. The problem wasn't really buying it, but eating it. The taxidermy bear sitting at the bar in Newberry and then standing in the hallway to the restrooms. Bears and beers don't mix. The over-sized ice cream cone a the Dancing Crane in Brimley. When you order one dip of ice cream you don't expect you will need the help of three other people to eat it. But I must admit, ice cream never tasted so good! After a long pace line formed behind us someone said Jim was really good at “pullin’ the chain” into a headwind. Way to pull that chain, Daddy-O! Yooper Ale at the Main Sail in Detour Village. Now this wouldn't be so memorable because we have beer in every town. However, Detour Village has two bars and one of them has a sign on the door that reads "Cash or Check Only". Really? People still pay their bar tab with a check? This was also the last night we would be camping so we toasted some of the events of the last week with heart felt memories and true camaraderie. Getting out of the sleeping bag at 5:30 a.m. every morning, but especially the morning the temp dipped to below 50. Brrrrrrr. This was the same morning Bike Junkie ran to the porta-potty in his skivvies. The poor guy attempting to relieve himself on the side of a convenient store and getting thumped by our Marine SAG driver. He came out from behind the building like a puppy dog with his tail between his legs and got in line for the porta john with the rest of us. Getting to a rest stop and finding out there was no potty. I merely stated the fact that if we didn't find a bathroom soon I would have tears running down my legs. This prompted Bike Junkie to declare he needed to find a better class of friends. Really Dude? You walked through the campground in your undies. Did I mention mosquitoes? Big, hungry Mosquitoes? With sharp teeth and beady eyes? That liked to buzzzzz right by your ear while you tried to sleep? Then laugh when you smacked yourself in the head so hard it made your ears ring? 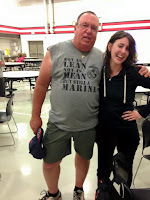 Chelsea's most memorable person was Doug the Marine. 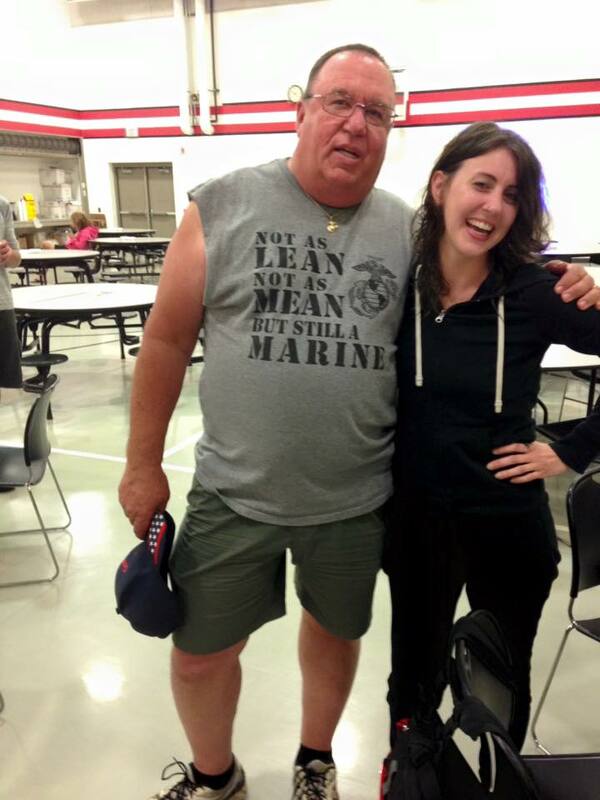 "Not as lean, not as mean, but still a Marine!" Ethan's most memorable person was Bob from Columbus. I dont know who Bob was but Ethan said he always seemed to beat us to the bars. Jim's most memorable person was Sam with the Salsa and the wooden fenders. Sam was riding solo but liked to join us for a few beers after dinner. Jim, being such a Bike Junkie, was fascinated by Sam's handmade wooden fenders. My most memorable person(s) were the twins. They just always seemed to turn up wherever we were. There's the waterfall, and the twins. Let's stand under this shelter till the rain stops, with the twins. Look at the taxidermy bear sitting at the bar, next to the twins. You get the idea. "I can't take anymore hills or logging trucks!" Said I as we rolled into Newberry, Michigan at about 3:00 Monday afternoon. We had left Saint Ignace at 8:00 a.m. after a hearty breakfast served up by our hosts, the League of Michigan Bicyclists. This was the first day of the Michigan Upper Peninsula tour (MUP). A six-day, 350 mile ride around the UP. In between the start and finish was 70 miles of UP back roads. Of course that is about all there is in the UP. That and mosquitoes. And it wouldn't be a bike tour without a little rain. I should say without a down pour. We got to Renton, MI, about 44 miles into our ride and the skies opened up. The lunch was fantastic and most of the cyclists had already passed so we waited it out. The last stretch of road headed toward the school and our camp for the night was really busy. Not only was it busy, it had big trucks on it going 55 miles per hour. After dinner we headed to Timber Charlies where we met the bear and had a few beers. This was probably the most eventful day but also provided the most rain and wind. We woke up cold in Newberry, got started in the rain, it drizzled rain most of the way. By the time we got to the North Star bakery we were pretty much chilled to the bone. Big, warm, soft cinnamon rolls were a welcomed treat. When we left it was even colder than when we got there. Checkout my awesome arm warmers! Next we headed to Tahquamenon Falls to walk down 94 steps to the observation deck. The club blogger was there and captured us on pictures. After that we stopped to eat at the Camp 33 brew pub. You guessed it, for beer. We weren't very hungry after the cinnamon roll. I really liked the Black Bear Stout. After lunch we headed to Paradise with a 20 mile an hour head wind all the way. Sure didn't seem like Paradise to me! Jim and I decided to ride to Whitefish Point just to get the extra miles in. (Did I mention he was a Bike Junkie?) After dinner of pasties at the Paradise school we jumped on the bus and went back out to Whitefish Point to tour the Shipwreck Museum. This is where the infamous Edmund Fitzgerald went down, as did 6,000 other ships. Day three was very enjoyable. Each rest stop was in a park or picnic area next to the coast of Lake Superior. One of the stops was at the Point Iroquois lighthouse. 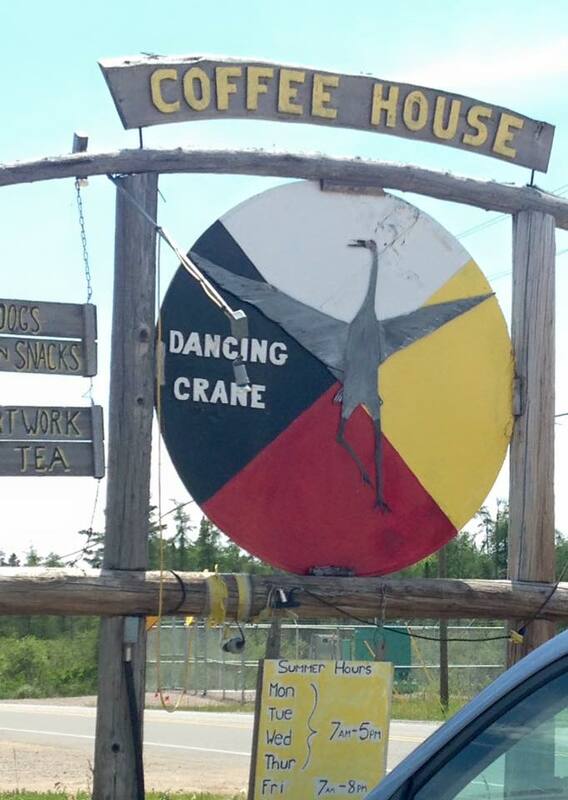 We stopped for lunch at the Dancing Crane Coffee House. Ice cream never tasted so good. Day 4 of MUP was the layover day, and a sorely needed one at that. We had experienced a lot of weather in the past three days - rain, 20 mph headwinds, full sun, 80 degrees, 50 degrees. Ugh. The route to the farm was pretty boring with part on a bike trail and part on a fairly busy road. I really hate being passed by the big trucks, buses, and trailers. 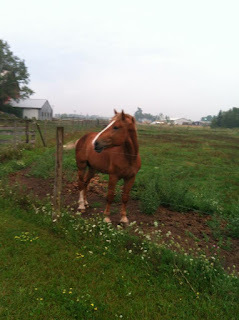 The horses were one of the biggest highlights of the entire trip. Three mares with foals. And I can't forget the two super-friendly kitties. (This is where my camera went on the fritz or I would have covered the page in horse pictures.) One of the mares preferred to sleep lying down and she snored. She was particularly fond of Chelsea and got horse slobber all over the front of her shirt. Eeeewwww! You can not visit "The Soo" and not go to the Soo Locks. We were able to watch two freighters, a tour boat, and a Coast Guard ship go through the locks. Well worth the trip but kind of like watching paint dry. Seriously? The wind changed direction so that, even though we are heading back, we had another headwind and more rain. 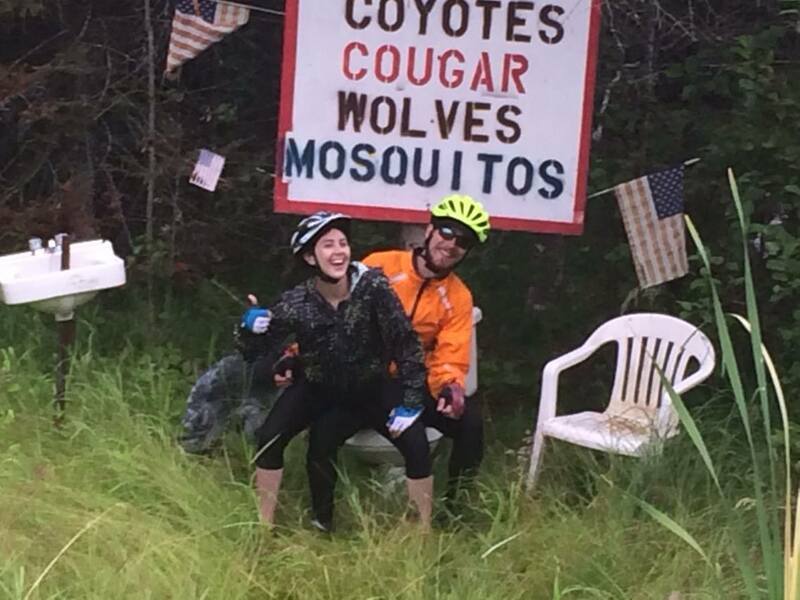 Sixty- two miles to get to Detour Village, MI and at least half was pedaling in the rain. We looked like drowned rats. Lunch at mile 44 was good, though, and the rain stopped while we were eating. The locals made homemade macaroni salad, baked beans, and sandwiches. They also made a lot of homemade cookies and brownies. The Snickerdoodles were fantastic. There was a steep, long hill leading up to the lunch stop. I could feel my calves knotting up so decided to get off my steed and lead him up the hill on foot. This is the stretch of road with the Wolverine Rest Stop tucked nicely into the woods. If you happen upon it and decide to visit, know you are forewarned that you will become mosquito bait. You should have heard the seagulls at our campsite Friday night. They must have been nesting on the top of the school. I was afraid all the tents would get bombed overnight. Last day of riding, warm sunshine, slight tailwind, and only 56 miles back to the car. We had a blast. First of all, at the end of a week-long tour of only 170 people you tend to make some new friends. Today we greeted and exchanged nice words with all we had gotten to know, stopping at the SAG stops to chat as much as to take a break. As reluctant as I am to get started on a long ride, I am just as sorry to see it end. The car ride home was almost as exciting with severe thunderstorms lighting up the sky all around us. We were glad to get home about midnight after getting up at 5:00 a.m.
Now to start planning the next tour. Next year. No more this year. No, you can't make me do it.